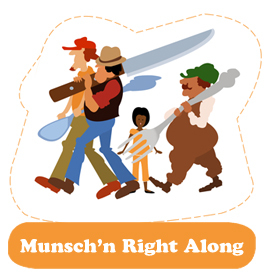 Tickets are now on sale for Wide Open Theatrical Escapades' Munsch'n Right Along. This show features six stories by best-selling children's author Robert Munsch. All shows will be held at The Refinery, 609 Dufferin Avenue, Saskatoon. Half-hour and one-hour performances are available and open to all ages. Advance tickets can be purchased online with PayPal or by calling 683-9460. Cash-only rush seating is also available for purchase at The Refinery 30 minutes before each show time. As always, Wide Open promises tons of audience participation and fun for all ages.